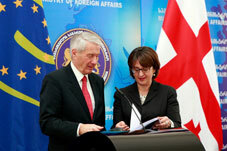 The Secretary General of the Council of Europe, Thorbjorn Jagland, visited Tbilisi on February 6. The main topics of the visit were Georgia’s relations with the Council of Europe, ongoing reforms and the launch of the Council of Europe Action Plan for Georgia. According to the information of the Council of Europe, the Action Plan for Georgia includes 34 projects and has a total budget of 17 million Euros. It was adopted by the Committee of Ministers in October 2013, and represents a comprehensive and coherent package of co-operation to support bringing national legislation, institutions, and practice in line with Council of Europe standards. Since 1999, Georgia has signed and ratified 69 Council of Europe Conventions, including the most important ones in the fields of human rights. Georgia is a member of 7 Partial Agreements, including the European Commission for Democracy through Law, better known as the Venice Commission. Georgian Foreign Minister Maia Panjikidze and Georgian Justice Minister Thea Tsulukiani attended the official presentation of the CoE Action Plan. Welcoming the peaceful transition of the Georgian government through democratic elections, Jagland said it is a good sign that a new president was also elected in a “fair and transparent” manner. He also expressed his confidence that the upcoming local self-government elections would be carried out in a similar manner. “This all gives me the basis to say that Georgia is on the right path,” CoE Secretary General said, adding that further reforms are necessary not only in Georgia but in other European countries as well. Jagland also said that the Council of Europe observes the trials of the former government officials and he personally believes that the processes will be held in the framework of the EU Convention on Human Rights, as well the rule of law will be protected. Emphasizing the importance of the document, the Georgian Foreign Minister said that the projects united under the 2013-2015 action plan would be beneficial not only for the state institutions but for the entire society. “As a European country, Georgia shares joint European values, respect of human rights, democracy and the rule of law,” she said adding that several amendments are planned in the local laws in order to get closer to the EU’s human rights’ laws. After the visiting Georgia, Jagland left to Sochi, where he will attend an informal meeting of sport ministers on the occasion of the Sochi Olympic Games scheduled on February 7.